James Cameron’s Avatar is a true cinematic event. Over the last twelve months, it has received the same levels of hype and suspicion as Mr. Cameron’s last film, a little movie called Titanic. Estimates put the cost of Avatar near $300 million, and were I a Hollywood studio executive, I’m not sure I would have financed Avatar. It’s a tough sell: a near three-hour sci-fi epic about blue-skinned, ten-foot aliens (I guess after you’ve made one of the biggest movies of all time, you can do whatever you want). I’m thrilled to announce that yet again, James Cameron has dreamt big, gambled, and delivered. Avatar is one helluva movie. 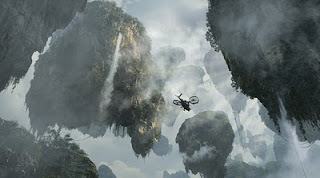 In the year 2154, humans have established bases on the alien world of Pandora. A human corporation digs up precious stones, and the military protects the advancing bulldozers against the Na’vi, the blue-skinned, indigenous aliens. Wheelchair-bound ex-Marine Jake Sulley (Sam Worthington) uses a genetically-engineered Na’vi body, called an Avatar, to explore Pandora. Sulley controls the Avatar body with his mind, and his mission is to gather reconnaissance on the Na’vi. The humans try to force the Na’vi off their land, but by the time the battle comes, Sulley finds Pandora and its people worth protecting. I understand why Avatar hasn’t come across very well in its advertising; it’s a spectacle that builds slowly over time and that must, must be seen in 3-D. I haven’t been the biggest supporter of 3-D technology, but Avatar should not be experienced any other way. I won’t want to own the film until 3-D technology comes to home theaters in a satisfactory manner. Avatar has also been released in a traditional 2-D format, because more showings on more screens mean more money, but seeing Avatar out of 3-D would be like watching Titanic on an iPod; you’ll see something, but it won’t be the experience that James Cameron intended. Up until now, Robert Zemekis’s The Polar Express had boasted the most impressive 3-D experience, but Avatar takes it to a whole new level. 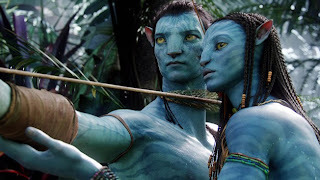 Film history will remember Avatar as the film that blew the 3-D doors wide open, just as Jurassic Park is remembered as the film that really launched computer-generated imagery. Avatar has more in common with Titanic than you might think. Both films run near three hours, both are sprawling, expensive epics, and both films devote their last third to action. I wondered if Avatar would be too long, but Cameron uses his time wisely. The huge action sequences work at the end only because of everything that comes before. We become fully immersed in the world of Pandora, and we care about the characters. If we didn’t, the action scenes would be as empty as Transformers 2, one of the biggest borefests of 2009. I think it’s important that Transformers 2 and 2012, both of which represent an outdated model, came out this same year. Avatar proves that effects-laden action still has value, but only when it serves the story and the characters. Pandora swallows us whole almost immediately. The world is remarkably well-realized, so that even though we know intellectually that everything onscreen is CG, we don’t think about it. We’re on Pandora. The jungle shimmers and glows with vibrant colors, and the 3-D effects only enhance the immersion. When objects reach out toward us, it’s not a gratuitous effect; it helps put us in the alien world. The Na’vi have human performances at their centers, and they shine through. All of this takes some time, but it’s crucial to the film’s success. If we didn’t care, it would fall apart. There are strong echoes of Native American culture, as well as of U.S. involvement in the Middle East (the phrase “Shock and Awe” even turns up). Mostly, Avatar is a modern retelling of the familiar story of Western civilization. Humans venture out and conquer less technologically-advanced people. We find an alien world, briefly appreciate it, then swiftly exploit it. That much at least seems realistic. Avatar is a film about foreign diplomacy, a bad economy, the vital importance of nature, and the over-consumption of precious resources. In short, it’s both timely and timeless. The science fiction setting is used to communicate classic themes, which will help bridge the gap for people who typically aren’t comfortable with sci-fi. Avatar was advertised under the tagline, “Movies will never be the same again.” I admire Cameron’s technical breakthroughs, but I still maintain that no amount of spectacle will make a bad movie worthwhile. Avatar doesn’t deserve praise for its effects as much as for how it uses them to tell a great story. Avatar will be a smash, but it doesn’t have the same level of universal appeal as Titanic. The characters here aren’t as strong, nor are the performances. That movie truly had something for everyone in every culture, and I don’t expect Avatar to garner the high number of repeat viewings necessary to match Titanic’s ticket sales. The only reason I consider the possibility is because of the shared director. James Cameron waited twelve years before following up the biggest box office success of all time. The man knows how to generate hype, but more importantly, he knows how to deliver on it. MPAA Rating: Rated PG-13 for intense epic battle sequences and warfare, sensuality, language, and some smoking. Despite its blue characters, Avatar isn’t kid-friendly. The experience is just too intense for preteens, though teenagers will love it and are old enough to understand the themes. The language never gets too strong but is pervasive, and while the violence isn’t bloody, it’s still upsetting, because we care about the characters. The sensuality is nothing to worry about.